I love looking at photos of family and friends; they bring back wonderful memories. Here is an example of such a picture. I used the 5Ws (who, what, when, where, why) to help me identify the details. 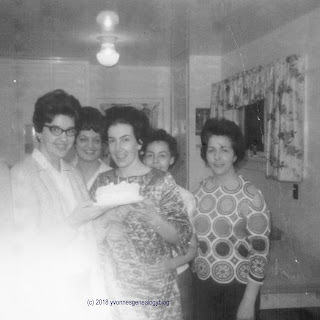 Left to right: Jeanne d’arc, Jacqueline (behind), Johanne, Jackie (behind), and Joan. Jacqueline (my Mom) and Jeanne d’arc are sisters; Mom and Joan are sisters-in-law; and Joan and Johanne are cousins-in-law. I think Jackie and Joan are related through their husbands, but I‘ve forgotten the connection. All the women are in their 30s. Three were at-home mothers, while two, who also had families, worked outside of the home. Mom lives with me now, but the other ladies still live in the town where I grew up. I remember them well, because they were a part of my life as a child and teenager. It looks like it’s a birthday, presumably Jeanne d’arc’s or Johanne’s, from the way they are holding a frosted cake with candles. The date stamp that I cropped out of the photo said “Apr 68”, but that date could be deceiving. I know that Mom didn’t always take her finished rolls of film to be processed right away, so the date could refer to that month or to a few weeks earlier, say in late 1967 or early 1968. Jeanne d’arc worked Mondays to Fridays, so the party was probably on a weekend night. The photo was in one of Mom’s old family albums, so she was likely the original owner. I don’t know who took the picture; perhaps the hostess or another guest? It’s not my family’s house or Jeanne d’arc’s house when she was first married. It also doesn’t look like Joan’s house, so it’s possibly Jackie’s or Johanne’s home. Birthdays were important to our circle of friends, so it’s natural we took photos of these milestones. I remember in the 60s, many people snapped a couple of photos at a time and waited to take the film for developing until the entire roll was full. That's why I, like you, have to take date stamps on old photos as "approximations." What a happy photo filled with smiling family and in-laws! I didn't think about the possibility that my mother might have waited until the roll was full to get it developed. I'll keep that in mind next time I look at old photos, Marian!